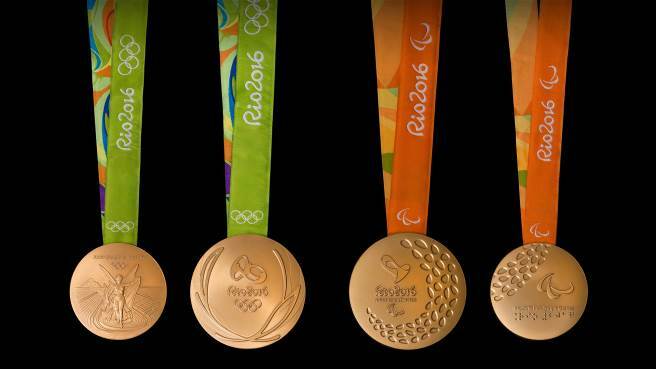 The Rio 2016 Organising Committee and the Brazilian Mint have unveiled the medals for the 2016 Olympic Games and Paralympic Games that the athletes will be competing for in August 2016. At the unveiling ceremony on 14 June 2016, they also claimed that the medals set new standards for sustainability. The medals use gold that has been mined without the use of mercury; silver and bronze from discarded materials; and ribbons made from recycled plastic bottles. It took about two days to create each medal. 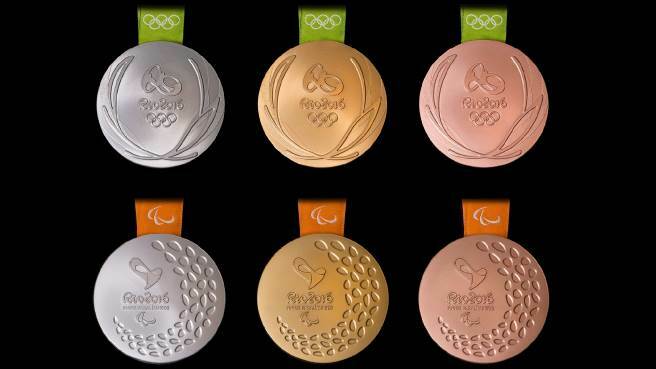 A total of 2,488 medals have been produced with 812 gold, 812 silver and 864 bronze medals. 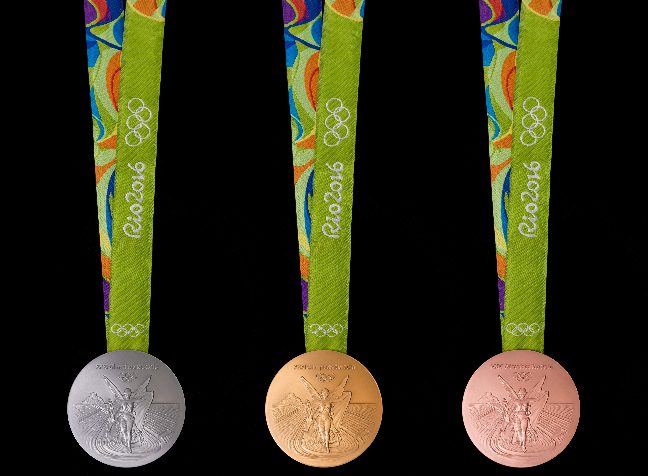 For the first time, the medals are slightly thicker at their central point compared to their edges. The designs feature laurel leaves – a symbol of victory in ancient Greece, in the form of the wreaths awarded to competition winners – surrounding the Rio 2016 Olympic logo. The laurel leaves represent the link between the force of nature and Olympians. According to Olympic Games tradition, the other side of the medals features an image of Nike, the Greek goddess of victory with the Panathinaiko Stadium and the Acropolis in the background. The name of the event is also engraved by laser along the outside edge. 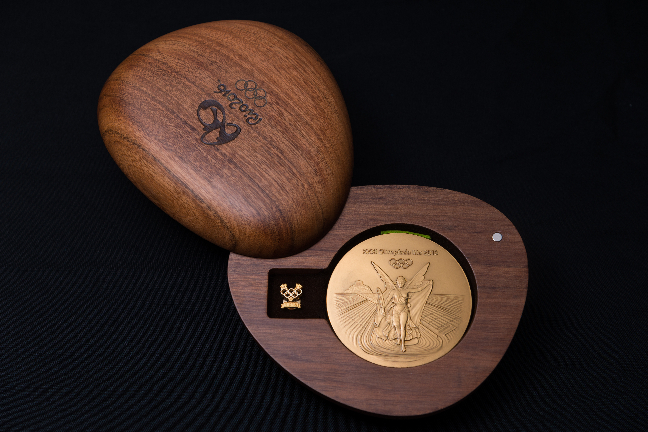 The Paralympic Games medals also feature a special innovation. A tiny metal device inside the medal emits a sound when it's shaken. 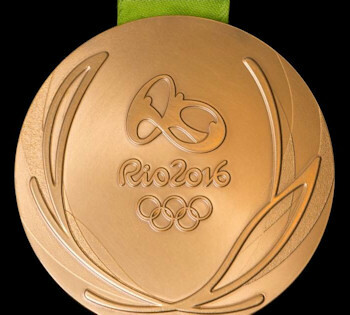 Each medal will produce more sound depending on the metal used, with the gold medal being the loudest. Bearing a design that celebrates the relationship between the strengths of Olympic heroes and the forces of nature, the 500g gold, silver and bronze medals have been made with sustainability at their heart. Some of the silver was obtained from X-ray plates, car parts and mirror surfaces, whilst the copper used to create the bronze was recycled from discarded materials at the Mint itself. Half of the plastic in the ribbons which will be used to hang the medals around athletes' necks comes from recycled plastic bottles. The material used to make the Paralympic Games medals rattle has been recycled from discarded material from the Brazilian Mint. And finally, the presentation cases which are designed in the form of a stone, are made from freijo wood sourced from a forest whose production has been certified as sustainable by the Forest Stewardship Council (FSC). "Today marks the start of the final countdown to the first Olympic Games to be staged in South America."